Contact!Unload blends soldiers’ stories with data to call attention to deployment-related psychological trauma. People go to the theatre for all kinds of reasons – to be transported and entertained, to engage with art and escape to a different reality. But what if it could also be space to find out about life-changing research? It is an idea that George Belliveau, a professor of theatre education at the University of British Columbia, believes in wholeheartedly. “I’m always trying to use theatre as a model or a form of dissemination to share whatever research story is out there, to make it a little more innovative or more visceral,” he says. And it is a guiding principle behind Contact!Unload, a play about mental health and war that Dr. Belliveau directs and developed with members of Canada’s Armed Forces. “There’s a saying in research that sometimes we dehumanize the human subjects by putting them flat on the page with our research stories, so I was trying to humanize these stories by bringing them onto the stage,” he says. Created with UBC’s Peter Wall Institute for Advanced Studies and the not-for-profit Veteran Transition Network, Contact!Unload is performed by Canadian combat veterans who tell stories of war, solitude and the difficulties of post-deployment life and coming home. The stories are all based on the veterans’ personal experiences and research data on soldiers. According to a federal report on suicide in the Canadian Armed Forces published last year, 14 male soldiers died by suicide in 2015, and those who are deployed are at higher risk of taking their own lives. 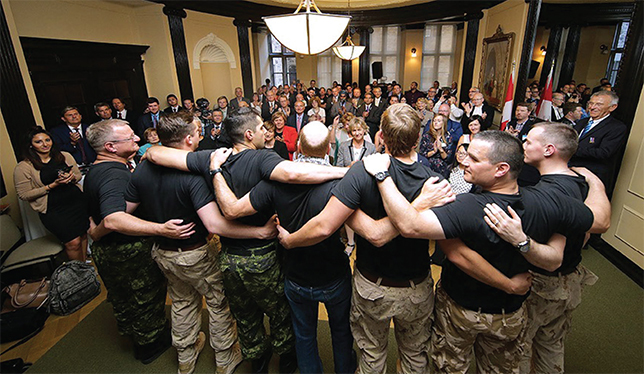 A Globe and Mail investigation from 2016 revealed that at least 70 Canadian military or ex-military members killed themselves after returning from the mission in Afghanistan, which ended in 2014. The cast of Contact!Unload performed on Parliament Hill last fall. Photo by Dan McKinney. Contact!Unload has already played to audiences in Canada and abroad (including a private performance for British Armed Forces veteran Prince Harry). This fall, it will show to hundreds of veterans at the Invictus Games in Toronto from September 23 to 30.